HELLO. This was a week of crazy health investigations and party preparations that I will share with you later, but first the important business of catching you up on my favorite Italian reality talent show. In the behind the scenes goings on we found out that Giada has a possibility of signing a record deal with either Sugar or Sony; we watched Debora open a cloche from Maria di Filippi to find her first CD underneath and letter saying what a sweet, misunderstood, powerhouse she is; and, lastly, we saw Giovanna the girlfriend and dance partner of Vincenzo go into a jealous rant about his passionateless and choreographed kiss with another dancer during last week's show that she found to be in bad taste. She looks sad that it is not a ciambella of some sort, but that is not true. Givoanna said that she would never have kissed another dancer no matter what. I can't keep these people from following me around. 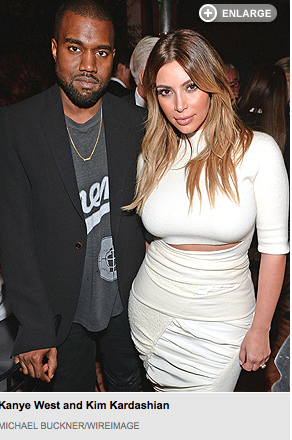 Apparently, they are coming to Florence to have their wedding at the Belvedere. 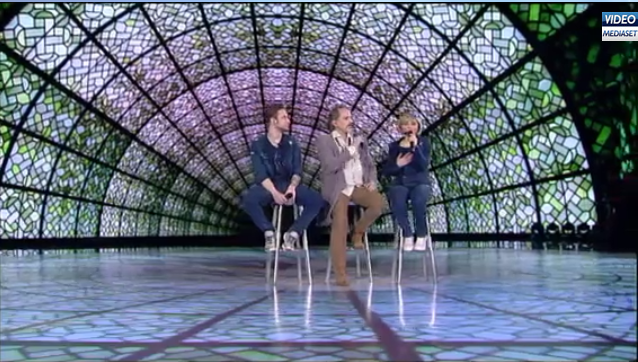 This week's program opens with the remaining white team members doing a tango number with Vincenzo and Giovanna dancing and Debora singing in the background.The blue team singing Life is Beautiful with their mentor Miguel Bose took the point. Debora sang next, but they gave her a very banal little ballad to sing against Cristian's epic gothic-style dance number that featured a candle lit chorus and a smoke filled stage. They jury didn't agree with me, though, and Debora won her white team the point. They introduced the judge of the evening Gerry Scotti who is an entertainment personality and gameshow host. 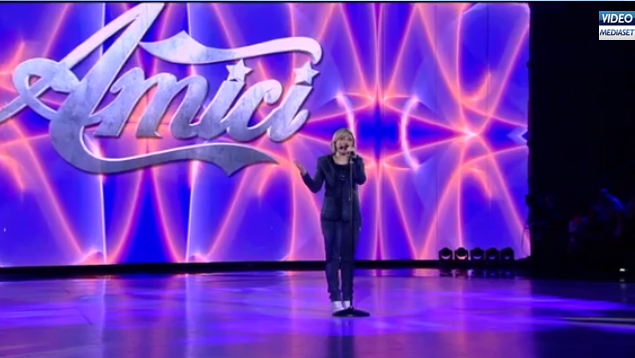 Miguel sent Giada out to sing Quando Nasce un Amore and she had a real diva moment. Unfortunately, she was paired up against Vincenzo's best effort to date. If Giovanna was incazzata/pissed about the kiss from last week, he is really going to be in trouble after tonight's show where he danced a bedroom number with two females of which she was neither and then went on to do a really charming group dance to Cinema Paradiso where he and his gang of friends end up in the laps of the judges watching the big screen. This is sign language for I am almost too good looking for my own good. I didn't know you spoke sign language! Debora about to receive her kiss from the Italian singing legend. Giada's reaction to her competition says it all. 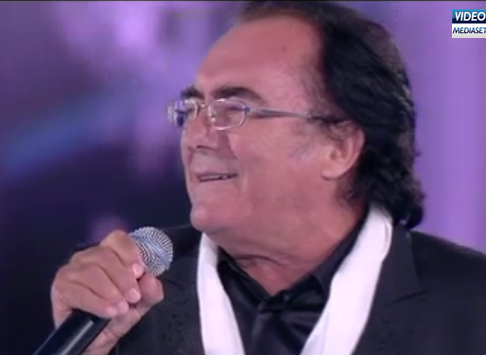 Scotti went on to say that Al Bano is the only singer who is able to mess up his hair - e' l'unico che riesce a spettinarmi. . . and the white team got the point despite the fact that Luca Argentero, who is 99% composed of hair spray and spray tan, voted for the blue team. 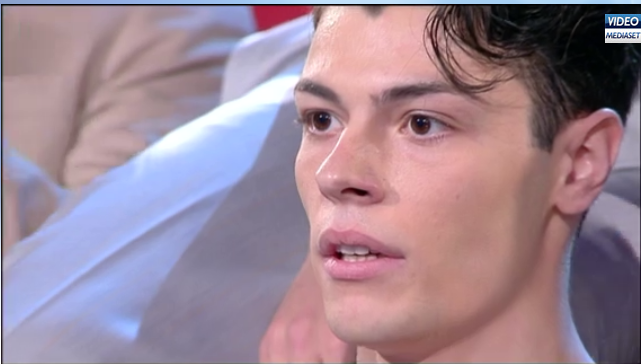 Cristian responded with a Japanese number that required him to dance with a long baton that he learned how to twirl in rehearsals during which time he managed to slap himself upside the head with while bruising an elbow. He didn't drop the stick once during the kimono filled performance, which was impressive. 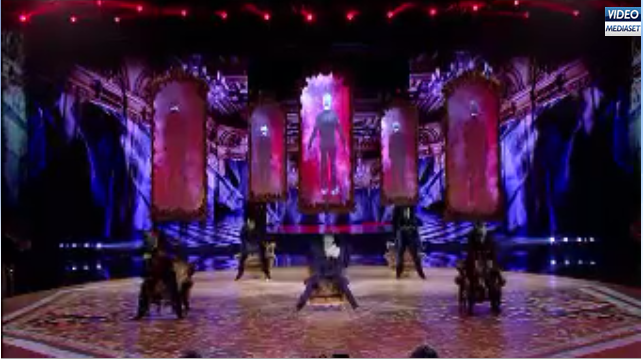 It is a big battle scene with a Chinese dancer who taught him the technique in rehearsals, and, in the last moments of the dance, Cristian leaps into his arms like they are lovers. 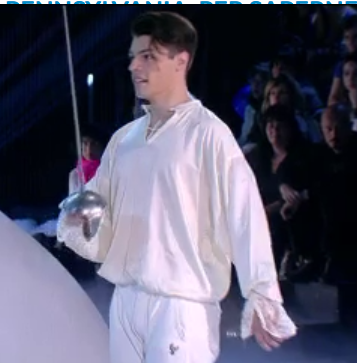 There is a lot of trash talk about the battle between the blue and white team dancers and Vincenzo is called to dance to Cassanova come il sciupacuori delle donne. 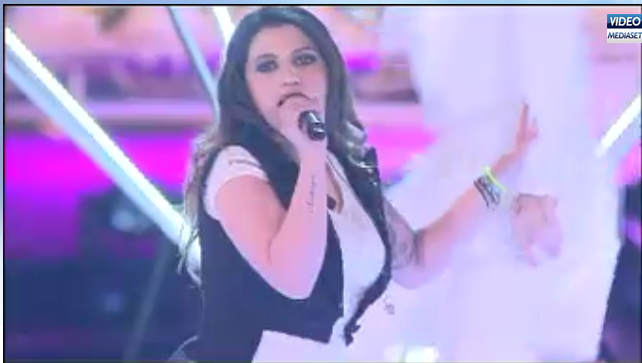 Here is the jury member Sabrina Ferilli's reaction upon hearing that Vincenzo is about to dance - not dancing, mind you, but about to dance. Vincenzo ends up sword fighting an opponent who just so happens to be a gorgeous female dancer who is not his girlfriend. 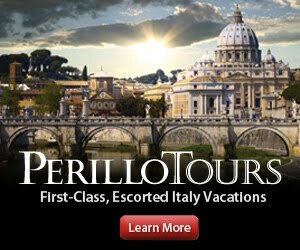 How do you say, "don't go home" in Napolitano? 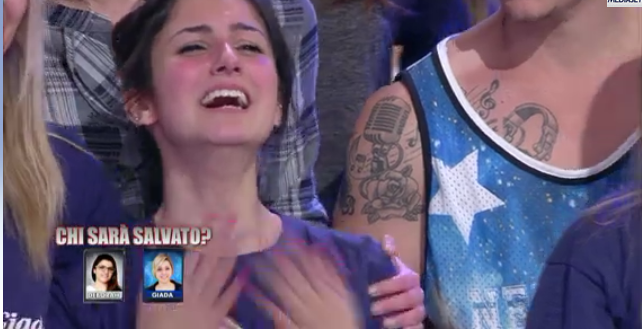 Sabrina votes for Vincenzo - che sorpresa! 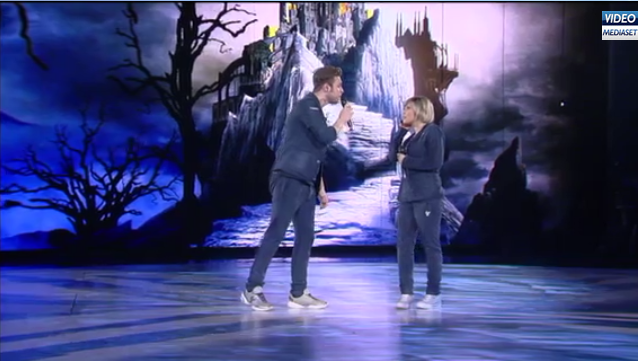 But the bigger surprise is that Gabry Ponte admits that he has changed his mind in favor of Vincenzo and, despite Luca's vote, the white team takes the point. 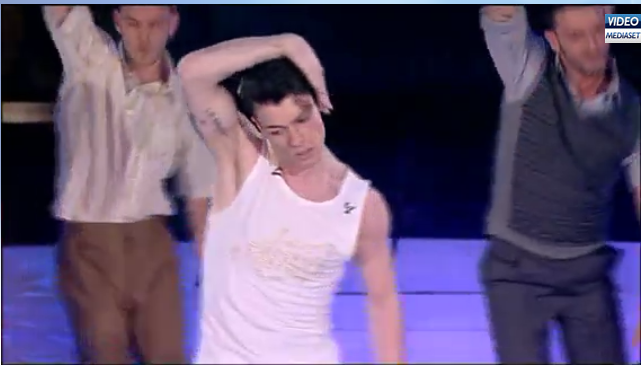 Miguel dismisses the number saying that it was only 20% dance. 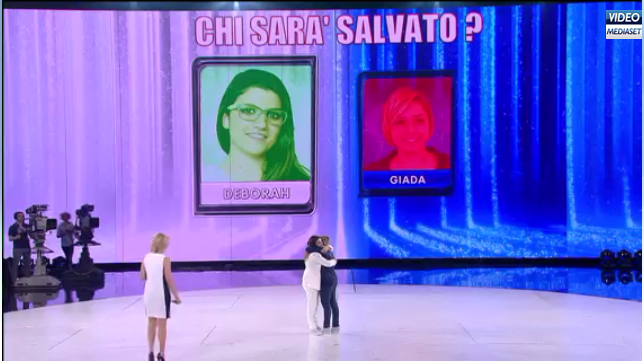 Nevertheless, the white team wins the first half and Giada is sent off the stage until the final vote, thanks in part to the heated battle among the team captains to defend their dancers and keep them in play. Debora starts off the second match in a duet of Senza te with her captain Moreno. Gabry Ponte, shmuck that he is, tells her that her weight loss must have led to new interior confidence. 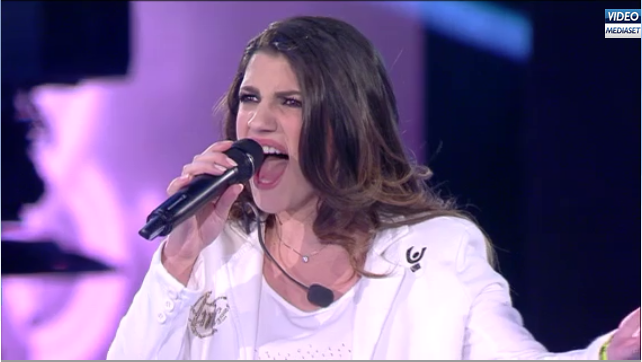 Debora sang against Alessio and his band Dear Jack whose inedito was on the radio this week in Italy, but he took the point. There was a funny moment in which Maria Di Fillipi gave them their CDs to hold up, but they didn't realize that there was a mix up and they were cross promoting one another. Next the dancers squared off again. Vincenzo did a folk dance inspired number where danced to the pounding fists of the other dancers who also spun the wheel or trotola on which he was dancing. 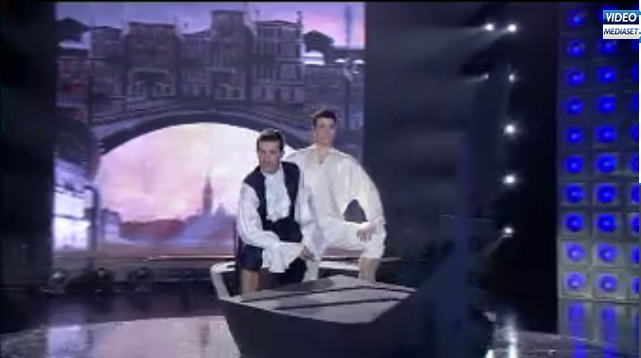 Cristian countered with a spectacularly choreographed number about bullying. 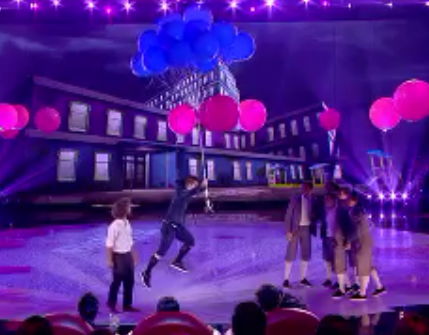 After being encircled and beat up by the other dancers, the piece ends with someone defending him and handing him a cluster of balloons with which he floats into the air above the stage. This didn't happen, but I got your attention. Aint I a stinker? Several of the judges were moved to tears. 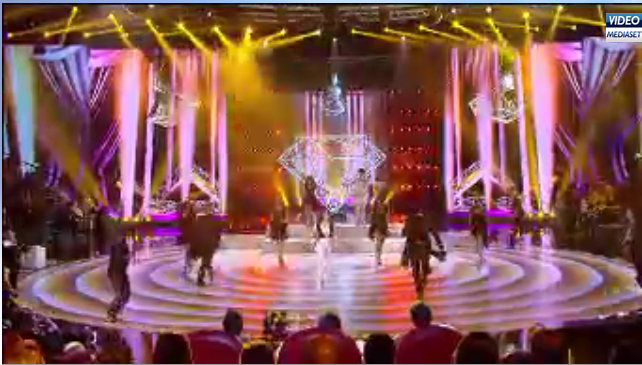 Moreno had no choice but to try to make them laugh with this Madonna version of Diamond's are a girl's best friend as sang by Debora with his rapping and Vincenzo's dancing mixed in. Alessio followed with his band and the judges had to weigh in. 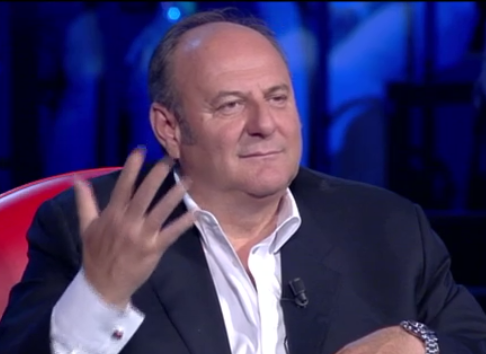 Moreno did a tribute freestyle rap to Gerry Scotti that was somewhat diminished by his mentioning his grasso che cola which means his fat that runs down, but in theory that shouldn't influence the vote one way or another. Very fittingly, the next dance was Vincenzo and Giovanna in a boxing ring. 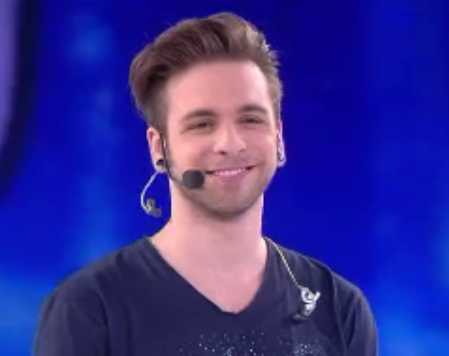 Scotti was hilarious, saying that even Vincenzina, as he called her since he didn't know Giovanna's name, had her bel perche', that is, reason for being there, and he, jokingly, voted for her. But Cristiano gave a really winning effort to a passionate dance, and two out of three judges voted for him. 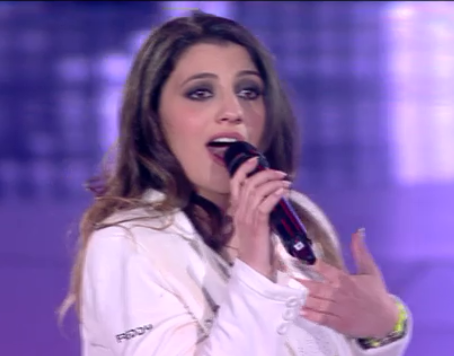 Debora sang her original song written by Fiorella Mannoia, Anche se fuori inverno . . . (mi sento gia' bellisima). 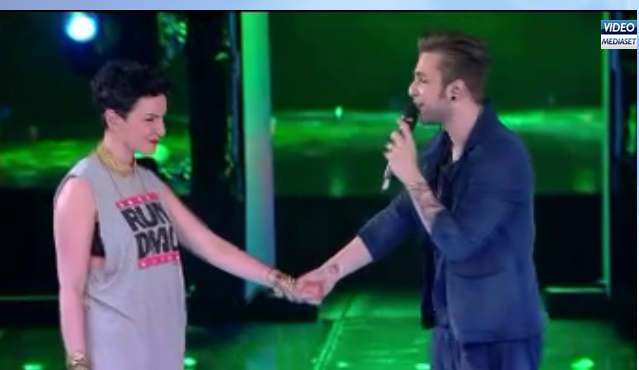 Alessio, for his turn on stage, got to do a duet with Arisa and he was the cutest thing holding hands with her and singing amore mio to her. Debora got the point, but in the match the blue team was ahead by three points so they won the second half. It was then decided that the person who had to then go to the final contest with Giada was Debora. The girls finally had to sing for their lives, which is what I have been waiting for since day one. You too, right? Giada started out by singing Beyonce's Halo and Debora sang Pink's Unconditionally, they were both karaoke kind of choices, but Debora definitely made a bigger impression on the public. Then they returned to Italian songs. I'm going to guess that Giada's was called Comunque sei, which was a real tear jerker that made you forget Debora for a second. Then Debora took on Aretha Franklin and killed the song Natural Woman. 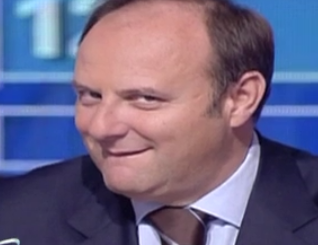 There was a pause where Maria Di Filippi had to say that she was worried about this one Giada/blue team fan in the audience who was crying throughout the battle and everyone hoped she could collect herself or darsi una calmata, poverina. It turned out to be one of Giada's friends. At the end, those crazy cats made Giada sing again while she was crying, but it was very sweet. Addio Giada!